Yesterday we went to the Berlin Modern Art Gallery and I saw, knowingly for the first time, paintings by Felix Nussbaum and was both moved and captivated by them. Born a German Jew at the start of the last century, he was to be murdered in Auchwitz - a fate shared by the whole of his immediate family. For much of the war, he was living in hiding in Belgium with his wife and son until discovered and deported in 1944. 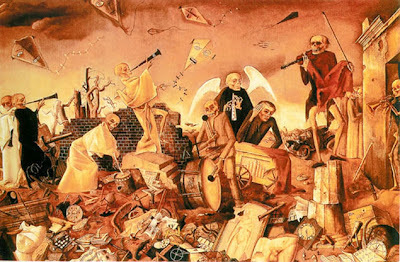 It is from this time that this haunting painting, the Triumph of Death, was completed. It is late medieval in evoking the carnivalesque, Dance of Death, as the skeletal figures process across a devastated landscape with the figure of the artist himself (?) on his knees, perched over what might be a wrapped canvas. Art on its knees, hidden from view, a shard of a remnant of disappearing hope? Yet the whole painting is suffused with a dark, mocking humour - a humour that is often present and was lightened in the Weimar period. 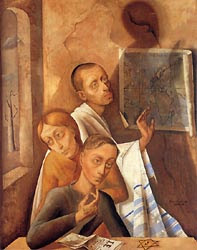 Here Felix, his wife, Felka and their son, sit contemplatively in a confined space, wrapped in their defining, imprisoning Jewishness, and out of the window lies a bleak autumnal landscape. It is a deeply melancholy portrait of a family in war, made war against. Faced with the enormity of what was unfolding, did unfold: you wonder what point art? 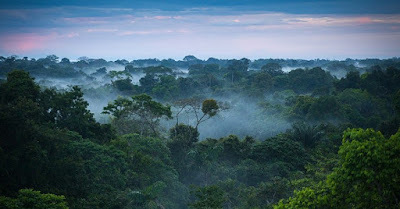 But here there is a partial answer - a family humanized, a global situation darkened, shown forth - you can begin to see the futility of the triumph of death, the joy inherent in the fragility of being human. It is a response whose very affirming emphasis emerges out of its quiet defiance. A painter continues to paint his and our humanity as the warriors temporarily try once more to eradicate it. It is the art, even if only in fragments, that survives.